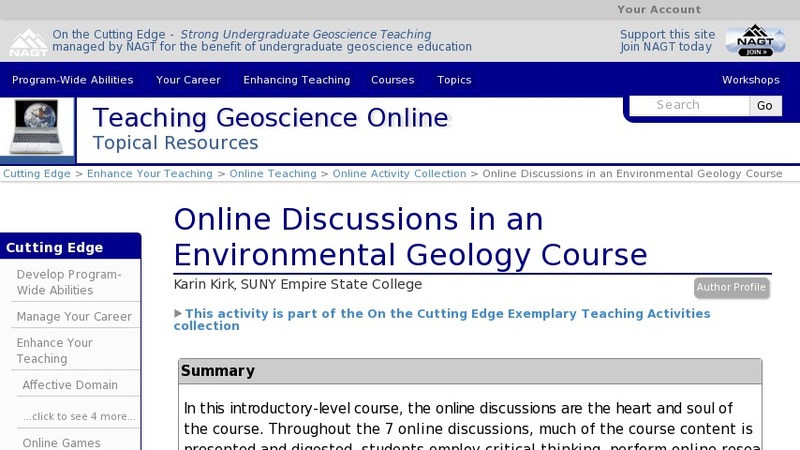 The online discussions are the single most important part of this course. They are worth more than any other component of the course and the students and I all put considerable time and energy into the discussions. Disseminating course content is one of the more challenging aspects of online teaching, and discussions help to fill this gap. In order to have meaningful contributions to the discussions, students have to not only understand the topic, but also need to share their comments on it and relate the topics to a larger question. For example, a discussion about developing geologically active land prompts responses that demonstrate understanding of dynamic landscapes, geologic processes, the role of zoning, hazard mitigation and disaster insurance. In addition, a few students are likely to have had personal experiences with natural disasters and thus add firsthand insights that enrich the discussion. Discussions are also a place where misconceptions arise and they can be easily addressed within this format. In a perfect world, students would be quick to point out flaws in each others' understanding, but when that does not happen, I seize the opportunity to point out the misconception (gently) and clarify it. Because students have time to research their answers and reflect on their writing, online discussions can bring out wonderful insights and rewarding debates. Introverted students who might otherwise not be inclined to raise their hand in a face to face classroom seem to have an easier time jumping in. If students are not participating enough, I let them know ask them if anything is preventing them from participating, encourage them to get more involved, and suggest some ways for them to jump in. The discussion topics all begin with open-ended questions that leave a lot of room for interpretation and the discussion is best when it wanders across a few topics. The discussions last for 1-3 weeks. For the longer discussions I have a series of follow-up questions at the ready. I post these to keep the topic moving, to get the class back on track, or simply to toss out a pop-quiz type question that alert students can grab onto. Teaching Tips Adaptations that allow this activity to be successful in an online environment We all know the dreadful feeling when you pose a question to a lecture hall full of students and all you hear are crickets. An online discussion can be far more thought-provoking than a face-to-face discussion because students have time to reflect on the topic, read up on it, and compose their response. So the adaptations are to start off with a very broad question that allows the topic to wander a bit. A sufficient time frame is needed (minimum of one week) to allow the discussion to develop. Lastly, the discussions have to be worth some significant part of the grade so that students do not treat them as optional. Elements of this activity that are most effective The most effective element of online discussion is the way students get pulled into the course and are engaged with the content. This is easy to observe by simply noting how active the discussion is. The discussion about climate change never fails to be the most active one and it really brings everybody to the table (including me!). Recommendations for other faculty adapting this activity to their own course: Start off with a very broad question that has no correct answer. When you compose the original question, also prepare a series of follow-up questions that you can use to keep the discussion moving. Limit the number of discussion boards to one at a time. Having multiple discussions going on simultaneously only dilutes the participation. Being engaged is critical. The first time I taught this course I really stuck by the "guide on the side" tactic. After that fell fairly flat I got more involved. Students enjoy the interactivity and we all get to know each other much better that way. I post pictures, share anecdotes and seize opportunities to respond to posts in a way that builds content, clears up misconceptions, asks questions, and praises outstanding contributions.